Letter to Mr. O.C. 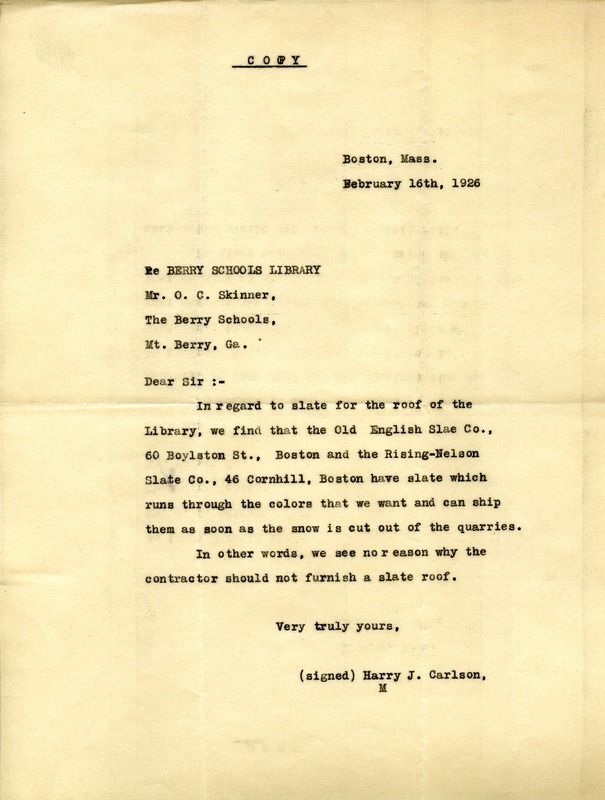 Skinner from Harry J. Carlson concerning the slate for the roof of the library. Mr. Carlson informs Mr. Skinner that they have found two companies that carry the slate that they need, the Old English Slae Co. and the Rising-Nelson Slae Co. Mr. Carlson says that they can ship the slate as soon as the snow is cut out from the quarries. Therefore, he tells Mr. Skinner that there is no reason that the roofer should not furnish a slate roof. Harry J. Carlson, “Letter to Mr. O.C. Skinner from Harry J. Carlson.” Martha Berry Digital Archive. Eds. Schlitz, Stephanie A., Haley Fortune , et al. Mount Berry: Berry College, 2011. accessed April 26, 2019, https://mbda.berry.edu/items/show/1168.